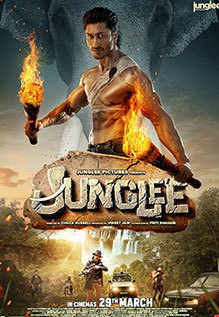 On The Whole, JUNGLEE Is A Clichéd Revenge Drama And Reminiscent Of The 80s And 90s Action Fare. The Use Of..
All Said And Done, Junglee Doesn’t Offer Anything Drastically New. It’s Slick And Stylish But.. Trimming The Length By 20 Minutes Wouldn't Have Harmed The Film. A Crisp Movie Would Have Had A Better..
It’s The Kind Of Movie In Which Our Hero Grabs A Venomous Snake, And Chats With It, And Is Chatted To, In..
Watch Junglee For Its Spellbinding Action, Cute Elephants And Gorgeous Jungles. Such An Adventurous And Brave..